Growing up the son or daughter of someone famous can be daunting and difficult, fraught with trappings and temptations not often experienced by someone not in that position. History is littered with the stories of children of celebrities “gone wild” or worse. In the late 1950s and early 1960s, there were few college football coaches more well-known or more respected than Bud Wilkinson. To top it off, Wilkinson’s University of Oklahoma Sooners football program was a perennial contender for the national championship, having won it three times, as well as 14 conference championships during his 17-year span as the Sooners’ head coach. It would be interesting to hear Coach Wilkinson’s take on the current events that plague college athletics today. 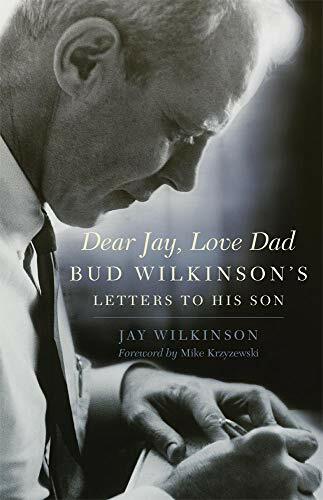 In Dear Jay, Love Dad: Bud Wilkinson’s Letters to His Son, we get a sense of what he might say. Most definitely we get the sense of the tone he might’ve written about. In each of the 47 letters, Coach Wilkinson’s son Jay writes about, you see an introspective man who has deep love for his sons and family life, while trying to juggle his professional and home life. Jay Wilkinson’s commentary offer insight into not only his internal struggles as a young man trying to make difficult life decisions mixed in with a famous last name, but also the gentle guidance his football coach father offers. The sage advice is that of a father offering his opinions about life and its paths as opposed to an overbearing parent trying to steer his son toward athletic riches. Jay Wilkinson was a talented football player in his own right and was named and All-American in 1963, as well as the Atlantic Coast Conference Player of the Year while playing at Duke University. The letters are personal, tender, and emotional. The senior Wilkinson was not only a football coach, but also an avid student of life who was involved in President Kennedy’s administration as the head of the Council on Physical Fitness. In the letters are fascinating tidbits of the life of a man you thought you knew by watching him roam the sidelines every Saturday in the Fall during the 1950s and 60s. Jay Wilkinson reveals so much more in this tribute to his father. Bud Wilkinson would be proud of his son Jay’s work on this book—and he would’ve told him so. Fans of college football and college athletics should read Dear Jay, Love Dad, a quick read filled not with self-aggrandizement nor righteousness, but sound, practical advice and lessons that seem long lost in today’s world of sports.